An easy beet salad, paired with toasted walnuts and dressed with a vinaigrette that starts with jam and brings out the natural sweetness of the beets. Even Rachael Ray's beet salad was loaded with calories. But MY version of the beet salad is light and lovely, entirely delicious and worth making. I like to make this as a main dish salad. (1) Stir the beets into the dressing and -- at the very last minute -- toss with the salad ingredients or (2) Dress the greens with the dressing, then top the salad with the beets without mixing them in. After early-on nixing this month's "Make It in 30 Minutes" food blogging event of the inpenetrable acronym IMBB (Is My Blog Burning), at the last minute, I felt suddenly inspired, if in a 30-minute sort of way. Who wants to spend 30 minutes figuring out WHAT to cook, then COOK it in 30 minutes? So I turned to the Grande Dame of Half Hours, Rachael Ray, whose food style has never inspired aside from the 30 Minute Schtick. Then I allowed -- start the clock, please -- five minutes to find something that worked. Easy was a given. Fewer pots than Rachael usually uses, please. And of course -- vegetables. Lo and behold, right off I did find something. TIME-WISE -- great, 35 minutes later, not counting the inevitable photo delay, supper was on the table. The chicken & mushroom goulash with store-bought tortellini (my on-hand substitute for store-bought gnocchi) was forgettable. But the beet & walnut salad was spectacular, a definite keeper (my recipe is above). The directions called for tossing the beets with everything else which discolored the lettuce and radishes; better would be to toss the salad without the beets, dress the greens and then top with the beets. Or -- this would make for a great beet salad, sans the greens entirely. PORTION-WISE -- Even cutting back the meat to a pound (vs 1 1/2 pounds), the goulash portion sizes were huge; that said, the volume was largely made up of peppers and mushrooms, so relatively healthful. The beet salad's portion size was again huge, better sized to a main dish salad than a side salad; still if you're going to err on the big side, salad's the place to do it. Made Rachael Ray's way, the goulash alone racks up 451 calories, 30 grams of fat and 11 points!! 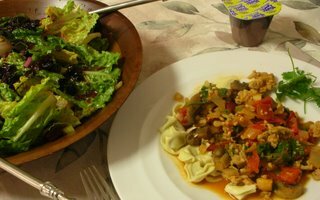 That's without the calorie-high tortellini/gnocchi! The beet salad isn't as "virtuous" as you might think -- see the nutrition information below the recipe. What bothers me is that -- even to me, someone who pays attention to ingredients/etc every single day as they relate to calories/health -- this Rachael Ray meal didn't look that bad! PRICE-WISE -- hmmm, $26 (with the pepper and stock on hand for the goulash; the beets, jam, poppy seeds, olive oil on hand for the salad). At $6.50 a person, that's more expensive than fast food, perhaps equivalent to a simple meal at some family-friendly casual dining place. It does budget $5 for the tortellini/gnocchi -- so rice or couscous would be a cheaper (and more diet-friendly) alternative. A BIG THANK YOU to Meg and Barrett from Too Many Chefs who're hosting this month's event and devised the 30-Minutes theme. I suspect the round-up will get millions of bookmarks -- I know I intend to send it around to my busy friends -- that means all my friends. And I know -- KNOW -- that I learned a lot by participating. So -- thanks! I really appreciate the nutritional facts that you post for all your recipes. On days when I feel a bit conscious about my recent consumptions, I almost always hit your site for a vegetarian option for dinner. Thanks. Cathy - thank you! It takes effort, no doubt. But I learn SO much with the discipline of nutrition analysis. I hope it's a passion that catches on! Alanna, what do you use for your nutrition facts calculation? Is it one of your "kitchen & diet tools"? Hi Tricia -- It IS in there, but I'm happy to say again. It's AccuChef which you can use for like 80 times, then license for $20. I've tried several others, this is my favorite because it's got a great Import Wizard (no re-entering data) and makes it easy to add new food items that don't happen to be in the USDA database. I've only had questions once or twice but have gotten responses from the guy right away. Thanks for such an informative and helpful post. I have been hestitant to try that salad, but will give it a try based on your recommendation. I do the same fidgeting around with RR meals to make them more health concious - whole grain pasta, brown rice, smart balance. They usally turn out pretty well. Thanks, again.